The perfect red lip can make your skin glow, make your teeth look whiter and turn every head in the joint IF, and this is a big IF, you choose the right shade. Unfortunately, the wrong shade or red can wash you completely out and make you look tired…and, well, no thank you to that! Not to fret though, there are a few key tricks to finding the red that is perfect and unique for you! Examine the veins on the underside of your arm. Are they blue or green? If they are blue, then you have cool undertones and if they are green, you have warm undertones. What color are your eyes? Generally, those with warm undertones have brown, hazel or amber eyes and those with cool undertones have blue, green or gray eyes. What undertones are in your natural hair color? Those with warm undertones will see red, gold, orange or yellow in their hair, whereas those with cool undertones will have ash, blue, or purple undertones. Once you determine your skin’s undertone, it is much easier to choose the right shade of lipstick. Those that have warm undertones should opt for reds with yellow or orange undertones to them. Cool undertones look best with lipsticks that have blue or pink undertones to them. Gone are the days of worrying about your skin shade (fair, olive, dark, etc.) and lip color. Rules are meant to be broken and, nowadays, they are! You see gorgeous gals with fair skin rocking bright reds all the time. The real key is the undertones. If they complement one another, you are golden! However, my last and most important…I’ll even go as far as to call it a rule, is that whatever color you choose…OWN IT! Don’t paint your pout in doubt and then spend the rest of the night worrying if it’s too dramatic, too bright or any other concern that may enter your mind. Wear your red lips proudly and be ready to turn some heads! 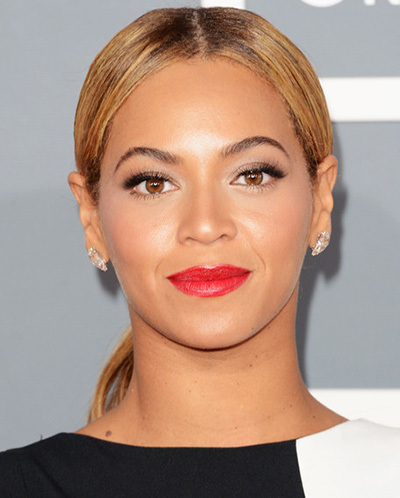 Check out a few photos below of gorgeous celebrities and their perfect lip colors!